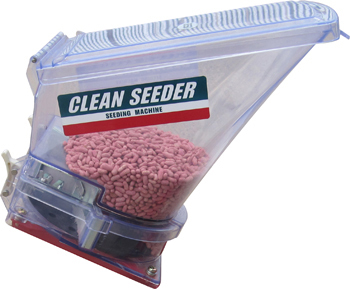 The Clean Seeder TP is an affordable seed planter that accurately plants seeds as small as peas and as large as squash, and handles all types of grains. Push planter and tool bar mounted styles are available to suit practically any large seed planting situation. The Clean Seeder TP employs the seed plate system, the time-tested system used on many reliable seed planters, and the preferred system for many growers. The seed plate is held by the metering unit at an angle. As the plate rotates, seed is singulated into holes in the plate. A repeller brush prevents additional seed from exiting the hopper. 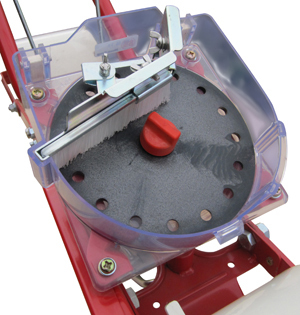 Because most larger seeds are planted fairly deep at 3/4-inch or more, the TP comes standard with a double disc opener. For crops planted shallower than 3/4-inch, an optional chromium shoe is available. Click here to see a list of plates at our Seed Plates page . The TP metering unit is driven by the front wheel of the planter. Drive is transferred via chain to an 11-spacing transmission. Five sprockets (included) can be paired in different combinations. 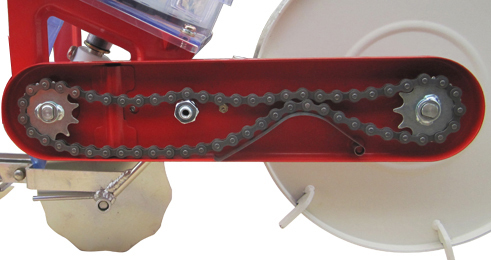 By pairing the sprockets in different combos and choosing different seed plates, any seed spacing between 2.36-inches and 10.63-inches can be achieved (exact spacing depends on sprocket pair and number of holes in seed plate). Checking seed level and observing seeding operation is a breeze thanks to the Clean Seeder TP's durable, tough, clear plastic seed hopper. A hinged lid covers the large hopper. The Clean Seeder hopper is simple to remove without any tools allowing for easy seed clean-out and quick seed changes. Seed plates and sprockets can be removed and reinstalled without any tools for easy seed changes or seed spacing adjustments. 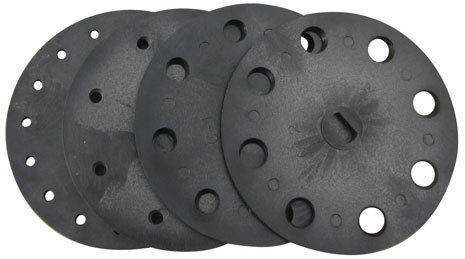 The Clean Seeder TP's plastic seed plates have holes of various sizes and quantities. The shape and size of the hole is matched to the seed size. The number of holes in the seed plate determines seed spacing. A wide range of plates are available for planting large vegetable seeds from peas, beans, and corn size, to pumpkin / squash-size, as well as grains like barley, sorghum, rice, etc. 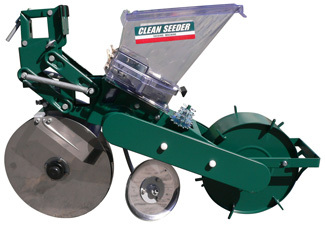 If you're familiar with Jang seeders, you'll note the Clean Seeder TP is very similar to the Jang model TD1 seeder. Many Jang seeder parts and Clean Seeder parts are in fact interchangeable. A wide variety of inexpensive seed plates are available allowing for planting of practically any large seed crop. Visit our seed plates page for more information.